As this singular formula dries down, I smell ritualistic hoodoo and hex muttered over muddy, pine-crackling fire. You can almost feel smoke in your eyes as prayers roll off tongues to gods and monsters. Underlying the intense verdant smouldering is a pretty obsessive carnivorous hickory note, as if meat were cooking somewhere, animal fats dropped into the fire. It’s a disconcerting effect to say the least, a hint of sacrifice mixed with devout religious observance. Like Norne by Slumberhouse, D.S. 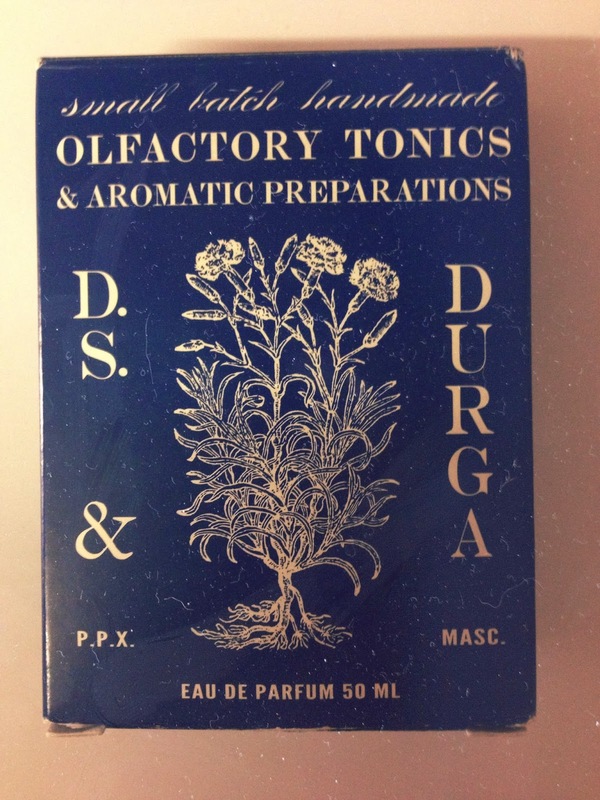 & Durga’s Mississippi Medicine is another very different and audacious assault on olfaction. Deeply complex, symbolic and full of archaic wonder. I really love this quirky and erudite Brooklyn-based niche brand. Founded by the graceful and modish husband and wife team of David and Kavi Moltz, D.S. & Durga has established themselves as one of the most intriguing and innovative perfume houses in recent years. 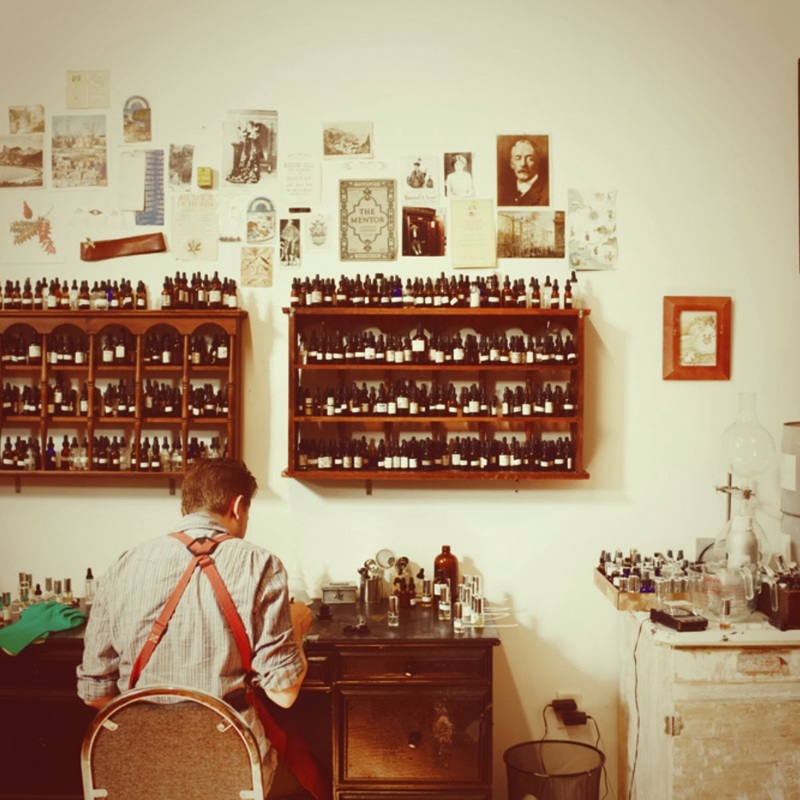 David is the perfumer and creator of the houses perceptive and atmospheric formulae. Kavi is the architect of the brand’s design, bottles, packaging etc. But you get the impression reading interviews with this gifted couple how symbiotic their relationship is and how much they feed off each other’s artistic and creative processes. 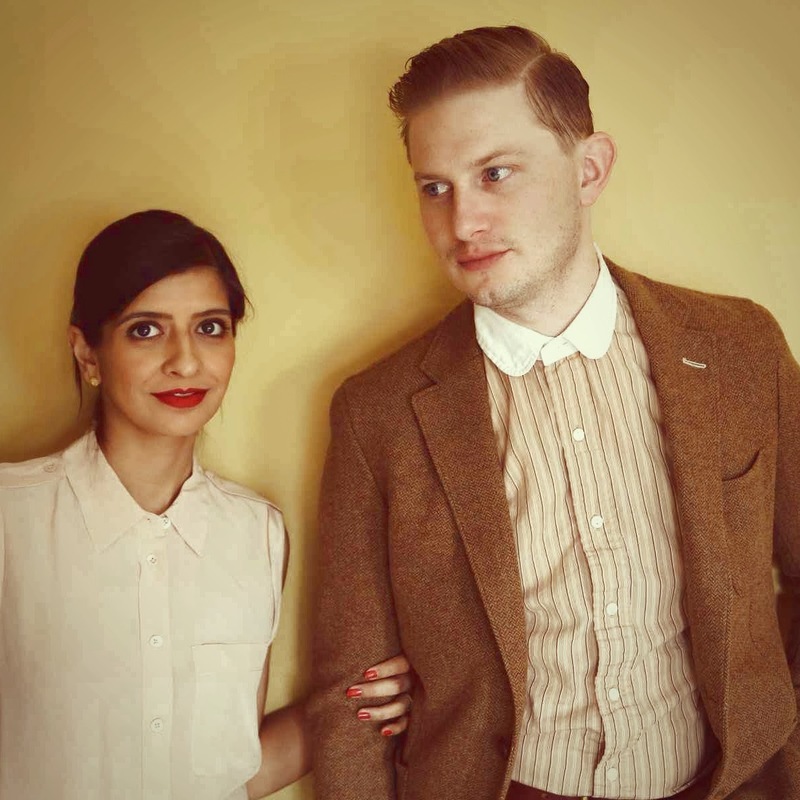 D.S.& Durga is very much a house steeped in the romance of Americana and the beauty of wordsmithery. I was drawn to the names of the fragrances and the sheer beauty of the brand’s illustrations, bottles and artistic website. So much consideration has been put into how the fragrances are perceived. When you enter the D.S.& Durga world you participate in an lost history, one where cowboys roam lazy dry plains, grass burns in the night, lonely fiddles drawl in the darkness, fur-trappers haul beaver pelts, arrows fly, dresses snag in Siberian snow and ritual incantations are muttered over mud and flame. The brand was founded in 2007 making small batches of scented produce for friends and family. Indeed the boxes proudly proclaim small batch handmade olfactory tonics and aromatic formulations. There is something calm and collected about the Moltzs, they have a strong sense of self-belief and have managed to walk that somewhat difficult line between personal indulgence and artistic expression with understated aplomb. The creation of the fragrances involves huge amounts of research in raw materials, influences and I think uniquely – atmosphere. There is a feel of painters and sculptors at work. Images of David Moltz in his leather apron over crisp white shirt, dipping his nose to vials, bottles and beakers against walls covered in sketches, notes, paintings and swatches are more akin to snapshots of painters working in lofts in the 70s and 80s. The scents reek of hidden passions and obsessions. Drops of history and storytelling swirled into grasses, resins, smoke and wild flowers. 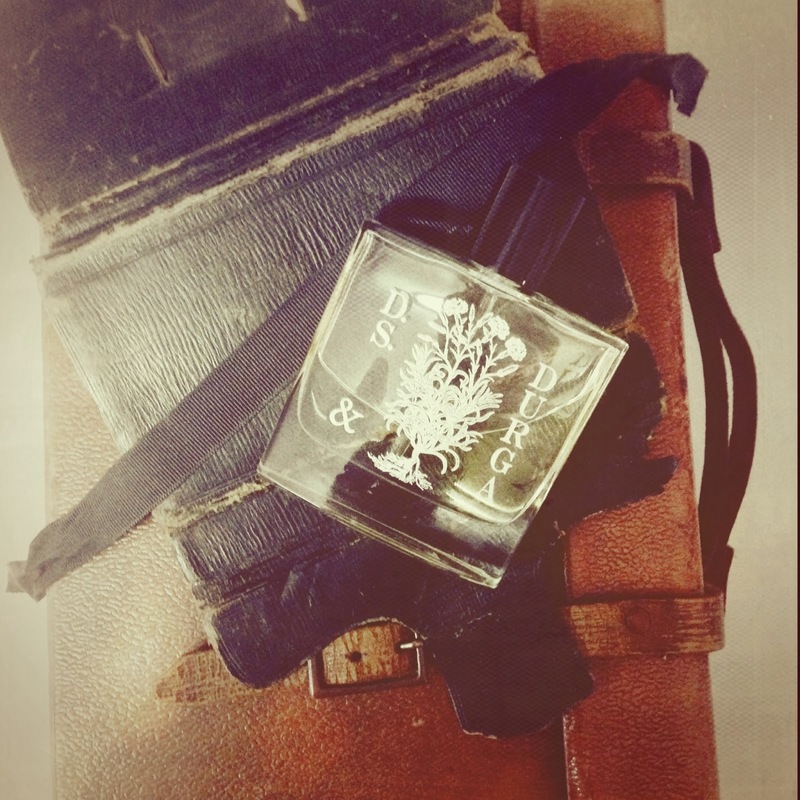 Names like Bowmakers, Cowboy Grass, Burning Barbershop, Silent Grove, Spent Musket Oil, Boston Ivy, Siberian Snow and Freetrapper instantly conjure up the most evocative scents capes. I think sometimes fragrance houses forget how powerful a name can be, how much of a psychological pull it can exert on a potential wearer. Of course the juice matters, but romancing and seducing your audience with thought-provoking and cinematic names is something many brands neglect to their cost. David and Kavi Moltz have thought long and hard about how to present their precious brand and it shows. It oozes personality. There is a cool, must-have vibe to it, but not in an irritating hipster way that seems to permeate so many small-scale operations. 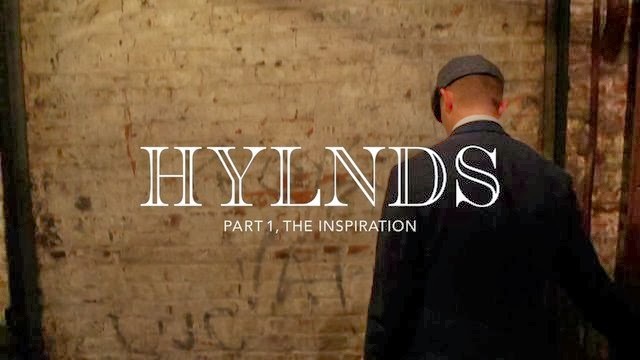 The roots of the brand lie in 2007 Brooklyn as the US economy struggled with debt and the shadows and collapses of large scale manufacturing processes. In Brooklyn there was a resurgence of interest in all aspects of artisanal work, pushing and developing craft skills to provide a quality product be it skincare, scent, leather, furniture, glass or chocolate. David Moltz’s deep connection to the bones of fragrance go back to winning a bottle of Pierre Cardin cologne in a summer camp raffle when he was a boy. There is music in his blood and he moved in New York in 2002. Kavi studied architecture in LA and design in Holland, but travelled extensively as a child. She met David after returning to New York to start work as an architect. The brand started privately, concocting formulae for friends, small batches of very precise perfumes and colognes. This artisanal approach, in keeping with the ethos of the time and their milieu was to inform everything they would do. Kavi realised she could utilise her artistic and architectural skills to contain and design the products the couple were producing. The bottles and packaging are very distinctive utilising elegant lines, just the right amount of historical reference and a simple strong clear flacon that highlights the delicate shades of bottled juice. D.S. Durga have married a love of true Romanticism with the potent dust-tinted Americana of Dorothea Lang, O’Keefe, Hopper, James Dean and the abiding power of Thoreau, Dickenson, Emerson, Willa Cather and the paintings of Thomas Cole and Charles Deas. I hear Nathalie Merchant, Patti Smith and the McGarrigle Sisters when I sniff their scents. There is so much botany, culture, history, archaeology and anthropology seeped into the work. 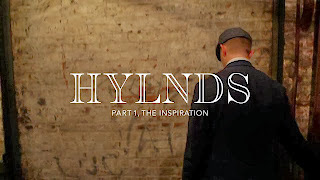 Many brands aspire to this level of erudition but David Moltz’s research and commitment is evident in the texture, heft and atmospherics of the orchestrations. The word art is bandied about rather a lot in the more rarified world of niche and artisanal scent making. Observers seem to think it is more acceptable to discuss smaller scale operations in such esoteric terms and simply dismiss the big Houses as materialistic unimaginative sell-outs. But of course it is not quite as simple as that. Anyone who has recently worn Love Chloë, Balenciaga’s Florabotanica, Michel Almairac’s sublime leather for Bottega Veneta, Cartier’s Baiser Volé or Kurkdjian’s Elie Saab scent will know the line between commerce and perfumed art is often very blurred indeed. The reverse is true, some niche scents aspiring to art can be deadly dull and leave one underwhelmed. The Olfactive Studio series left me terribly unmoved recently. I did revisit and try again, falling for the charms of Cresp’s crisp apple and rhubarb Flashback, but otherwise the range for me, falls very short of the artistic and olfactory aspirations of the brand’s somewhat painful manifesto. D.S.& Durga however do art; mixed with history and an intense love of communicating their passions to the people who buy and wear their unique formulae. David Moltz has gone beyond mere blending, he strives to achieve a place, a moment, and a broken blade of grass beneath an exhausted furtrapper’s steed. There is immense, microscopic precision in his harvesting, examination and allocation of rare grasses, resins, barks, seeds and oils. Reading about his work and looking images of his workshop, walls covered in inspirational data, drawings, text and writing, it reminds me a little of Darwin’s obsessive notebooks, everything noted down in incredible detail, nothing forgotten, every little line, nook, crevice, vein, pod, spill, foam, slick, tone, blush, odour, texture duly noted and stored for future reference. The fragrances feel accurate. I know we are talking about a collection of notes in alcohol here, but occasionally a perfumer comes along with a singular vision and creates a body of work striving to persuade the senses that olfaction can indeed stir heart and mind. Mississippi Medicine is powerful stuff and not the sort of thing I would ever normally wear, but my god it really has me in its spell. It took me a few wearings to adjust to the shock of the birch tar, a note I’m not particularly used to in this kind of form. It is so dense and atmospheric with a genuine sense of oozing bark and damp lichen-clad tree trunks. It smells battleship grey, pungent and initially somewhat choking, but like anything strange and challenging, it takes a little adjustment time to fully appreciate the raw depth and beauty of this incredible note. It filters through the entire composition, insinuating itself, ebbing and flowing like ectoplasm over viola, white spruce, incense and earthy bitter cypress root. The simplicity is both striking and telling. Like couture and breathtaking food it is often a case of taking a few choice materials with genuine power and meaning and using these to create the illusion of complexity from simplicity. The inspiration for Mississippi Medicine as with all D.S.& Durga creations is rooted in a real place and time. In this case, the Mississippian era Southern Death Cult or Southeastern Ceremonial Complex, a loosely connected network of cultures based in the Southeastern states of the USA between 1200 and 1500AD. They were mound builders, sun worshippers and introduced maize agriculture to the region. Their religions were incredibly complex and revolved around detailed pictorial representations of how they perceived the cosmos. Theirs was a tripartite world held together by an axis mundi, often represented by a cedar tree. The Above World or over world is for the birds and winged things. The Middle World, our world is us and our four-legged friends. The Beneath World is dark and stirring with malcontent and danger, a world of snakes and venom, insects and the Corn Mother or The Old Woman Who Never Dies. It is the rituals to placate her and settle any ill will with the Beneath or Underworld that inspired the smoky arboreal observances of Mississippi Medicine. The tribes would burn pyres in the forests and use sweet plants, roots and leaves to enhance the scent of the smoke rising upwards, raising the perfumed mists skyward. This must have been a potent and intensely atmospheric ritual, full of portents and drama. Plants such as pine, holly, cypress, laurel, cedar, spruce were all use to add resinous ambience to the ceremonies. After the pyres had died down and the smoke faded off on high to the gods above, the ashes were covered and buried back into the soil, returned beneath. The weather is turning here in my city of stone and ghosts. The nights stretching out, shadows everywhere. This is my favourite season, leaves roll like giddy wheels and skies swell and squall. It’s a time for smoke and woods, resins and peat. One of my previous posts was on Angela Flanders' deeply beautiful Aqua Alba, a whisky inspired perfume, thick with oud, peat, cedar, heather, oakmoss and amber. It smells of Edinburgh. Hops, stone, leaves, the sea, smoke and dank dirty cobblestones and while Mississippi Medicine induces similar emotions, it perturbs me in the wearing. I feel haunted, tendrils of those ancient forest pyres tracking me homeward through sodium-glared streets. It goes on with tremendous force, assailing the senses with the salt-preserved meat-whack of bacon/birch tar and then opens up and blooms like muted grey fire. Birch tar has traditionally always been used to create so-called Russian leather notes in perfumery and is responsible for the fuckable Cossack dreaminess of Chanel’s original Cuir de Russie. Andy Tauer uses it to eerie effect in his hymn to manly isolation, Lonestar Memories and I love it in Vierges et Torreros by Etat Libre d’Orange, although I have to be in the right mood for this, its very flayed in tone, as if the matador has flung the bulls testicles in your face, then slapped you senseless with a bouquet of flowers. I once watched the most fascinating documentary about hunters in Siberia, milking the birch trees and cooking down the sap to the most extraordinary toffee-like consistency. They used it to ward off the horrific onslaught of midges in the summer, smearing the birch paste over themselves and their hunting dogs. 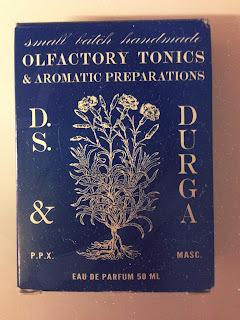 The development of D.S.& Durga fragrances isn’t exactly linear but then isn’t exactly conventional either. Mississippi Medicine rolls and shifts like smoke tugged in hot merciless winds. The roots and woods are dry and pungent, reinforcing the dramatic aura of the smouldering birch tar. The touch of wild viola seems incongruous, but there are terpenes in the scent of some violas and this marries their tonality instinctually to the forested surround of the other notes. It is an incredibly robust scent, lasting for hours on skin and even longer burrowed into the fibres of cashmere scarves and merino wool shawls. I threw on a huge tartan wrap this morning and instantly immersed myself in the ghosts of a hundred bonfires. Right now I am in love with the ritualistic voodoo of this remarkable scent, the incantatory imaginings that David Moltz has arranged in the structure and artistic language of Mississippi Medicine. Its beauty is harsh, brutal, archaic even, the reference points esoteric and obscure, but what matters is the juice, the medicine. Part of me was reluctant to share this voodoo smellin’ thing, it felt so intimate and strange. Not medicine for all tastes, but once acquired, I feel addiction is assured and eternal. Reading this post cast me into an otherworldly cinematic fantasy, partly based in memory fragments of my real life journeys and partly in my imagined ones. I was jolted out of this dream state by the brilliant description of Vierges et Torreros. When I smelt it, it was not bull's balls that smacked me in the face but badly cured cheap Tunisian tourist handbags. Which are probably only one molecule distant from the smell of bull's balls. 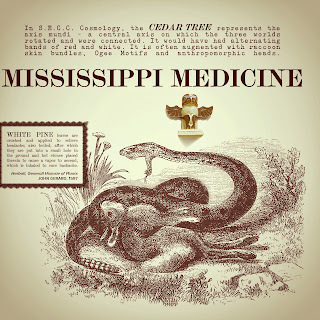 Mississippi Medicine sounds enthralling. I'd be curious to try this corporeal creation.